For other uses, see Cradle of Humankind (disambiguation). The Cradle of Humankind is a paleoanthropological site about 50 kilometres northwest of Johannesburg, South Africa in the Gauteng province. Declared a World Heritage Site by UNESCO in 1999, the site currently occupies 47,000 hectares (180 sq mi) and it contains a complex of limestone caves. The Sterkfontein Caves contain the discovery of a 2.3-million-year-old fossil Australopithecus africanus (nicknamed "Mrs. Ples"), found in 1947 by Robert Broom and John T. Robinson. The find helped corroborate the 1924 discovery of the juvenile Australopithecus africanus skull, "Taung Child", by Raymond Dart, at Taung in the North West Province of South Africa, where excavations still continue. Sterkfontein alone has produced more than a third of early hominid fossils ever found prior to 2010. The Dinaledi Chamber contains over 1500 H. naledi fossils, the most extensive discovery of a single hominid species ever found in Africa. The name Cradle of Humankind reflects the fact that the site has produced a large number of (as well as some of the oldest) hominin fossils ever found, some dating back as far as 3.5 million years ago. In 1935, Robert Broom found the first ape-man fossils at Sterkfontein and began work at this site. 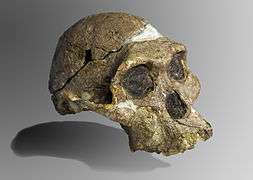 In 1938, a young schoolboy, Gert Terrblanche, brought Raymond Dart fragments of a skull from nearby Kromdraai which later were identified as Paranthropus robustus. Also in 1938, a single ape-man tooth was found at the Cooper's site between Kromdraai and Sterkfontein. In 1948, the Camp-Peabody Expedition from the United States worked at Bolts Farm and Gladysvale looking for fossil hominids but failed to find any. Later in 1948, Robert Broom identified the first hominid remains from Swartkrans cave. In 1954, C.K. Brain began working at sites in the Cradle, including Cooper's Cave. He soon would initiate his three-decade work at Swartkrans cave; it would result in the recovery of the second-largest sample of hominid remains from the Cradle. The oldest controlled use of fire by Homo erectus was also discovered at Swartkrans and dated to over 1 million years ago. In 1966, Phillip Tobias began his excavations of Sterkfontein which are still continuing and are the longest continuously running fossil excavations in the world. In 1991, Lee Berger of the University of the Witwatersrand discovered the first hominid specimens from the Gladysvale site making this the first new early hominid site to be discovered in South Africa in 48 years. In 1994, Andre Keyser discovered fossil hominids at the site of Drimolen. In 1997, Kevin Kuykendall and Colin Menter of the University of the Witwatersrand found two fossil hominid teeth at the site of Gondolin. Also in 1997, the near-complete Australopithecus skeleton of "Little Foot", dating to around 3.3 million years ago (although more recent dates suggest it is closer to 2.5 million years ago), was discovered by Ron Clarke. In 2001, Steve Churchill of Duke University and Lee Berger found early modern human remains at Plovers Lake. Also in 2001, the first hominid fossils and stone tools were discovered in-situ at Coopers. In 2008, Lee Berger discovered the partial remains of two hominids (Australopithecus sediba) in the Malapa Fossil Site that lived between 1.78 and 1.95 million years ago. 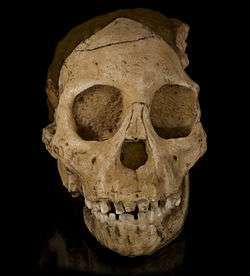 In October 2013, Lee Berger of the University of the Witwatersrand commissioned geologist Pedro Boshoff to investigate cave systems in the Cradle of Humankind for the express purpose of discovering more fossil hominin sites. Cavers Rick Hunter and Steven Tucker discovered hominid fossils in a previously unexplored area of the Rising Star/Westminster Cave System assigned site designation UW-101. In November 2013, Lee Berger led a joint expedition of the University of the Witwatersrand and National Geographic Society to the Rising Star Cave System near Swartkrans. In just three weeks of excavation, the six-woman international team of advance speleological scientists (K. Lindsay Eaves, Marina Elliott, Elen Feuerriegel, Alia Gurtov, Hannah Morris, and Becca Peixotto), chosen for their paleoanthropological and caving skills, as well as their small size, recovered over 1,200 specimens of a presently unidentified fossil hominin species. The site is still in the process of being dated. In September 2015, Lee Berger and the University of Witwatersrand, in collaboration with National Geographic, announced the discovery of a new species of human relative, named Homo naledi, from UW-101. Most remarkably, besides shedding light on the origins and diversity of our genus, H. naledi also appears to have intentionally deposited bodies of its dead in a remote cave chamber, a behaviour previously thought limited to humans. In the last days of the Rising Star Expedition, cavers Rick Hunter and Steven Tucker discovered additional fossil hominid material in another portion of the cave system. Preliminary excavations at this site, designated UW-102, have begun and yielded complete hominid fossil material of its own. It is unknown what the relationship of sites 101 and 102 is. Tumulus building at Maropeng visitors centre. The hominin remains at the Cradle of Humankind are found in dolomitic caves and are often encased in a mixture of limestone and other sediments called breccia and fossilized over time. Hominids may have lived all over Africa, but their remains are found only at sites where conditions allowed for the formation and preservation of fossils. On 7 December 2005, the South African President Thabo Mbeki opened the new Maropeng Visitors Centre at the site. 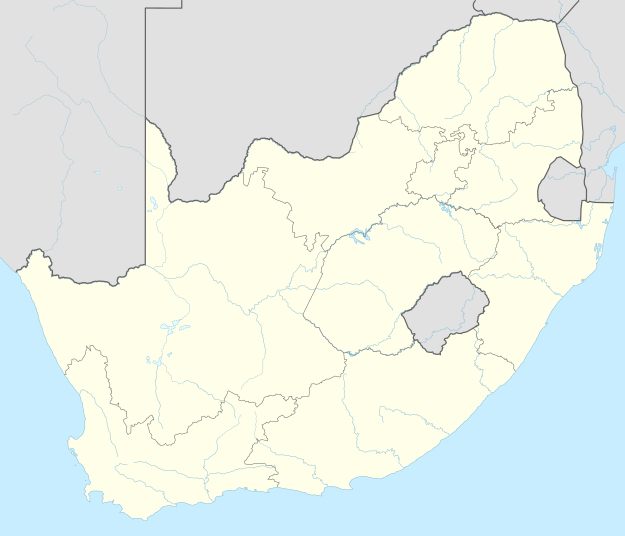 Wikimedia Commons has media related to Cradle of Humankind. ↑ Smith, David (15 January 2010). "Visit to the Cradle of Humankind". London: The Guardian. Retrieved 2010-05-20. ↑ Wong, Kate (10 September 2015). "Mysterious New Human Species Emerges from Heap of Fossils". Scientific American. Retrieved 12 September 2015. ↑ Fleminger, David (2008). The Cradle of Humankind. 30° South Publishers. pp. 7–10. ISBN 0-9584891-3-0. ↑ Hilton Barber, Brett; Berger, Lee R (December 2004). Field Guide to the Cradle of Human Kind: Sterkfontein, Swartkrans, Kromdraai and Environs World Heritage Site. (First ed.). Cape Town: Penguin Random House. p. 75. ISBN 9781770070653. Retrieved 10 September 2016. ↑ "New Species Of Human Discovered In South Africa". IFLScience. ↑ Photograph Mark Thiessen, National Geographic. "This Face Changes the Human Story. But How?". nationalgeographic.com. ↑ "Homo naledi, a new species of the genus Homo from the Dinaledi Chamber, South Africa". eLife. ↑ "Geological and taphonomic context for the new hominin species Homo naledi from the Dinaledi Chamber, South Africa". eLife. ↑ "Scientists bag more than 1 000 fossils at Cradle 'treasure trove'". ↑ "Mbeki opens Maropeng centre". News24. 8 December 2005. Maropeng, which means 'the place where we come from,' is expected to receive over 500 000 visitors annually, according to the Gauteng provincial government. Wikivoyage has a travel guide for Cradle of Humankind.